Char-Broil has been experimenting with different designs for cheap Gas/Charcoal Combo Grills and the Char-Broil Gas2Coal 3-Burner Gas and Charcoal Grill is the latest attempt at getting it right. The road to Combi success hasn’t been an easy one. There have been some failures along the way. Some successes too. Ultimately it’s been a mixed bag of end products, but we judge every model on its merits and we’ll see how far towards perfection they got with this one. I’ll be looking at the design, quality of build, Grill times, Grates and Assembly times, and after discussing all of these with you I’ll be letting you know if the Gas2Coal is worth the money. Shall we proceed? It’s a fairly typical Char-Broil design. Lots of their Grills look like this. It’s actually identical, apart from a few minor points, to the Char-Broil Gas/Charcoal Hybrid Grill. Which is not a bad thing because although there were some inclusions on the Hybrid that I didn’t like, the design was not one of them. So, you get a Cart on Wheels. Up top, you get one Side Shelf to the right and a Side Burner to the left. The main cooking area is in the center and there’s a spacious storage cabinet underneath. The wheels have been much improved from previous models so they’re pretty strong. As has the Metal used. It’s still Sheet Metal but it’s thicker than on the Hybrid and so it’ll last longer. The weight at 115 pounds tells you that the Metal is of a better standard. You get 420 Square Inches of primary cooking space and a 120 Square Inch Warming Rack. So for the price at around 240 dollars this is an incredible amount of space and enough to feed a whole family plus friends. You just aren’t going to get a good combi with this kind of space for anything under 400 dollars, So full marks to Char-Broil on space. Heat output has been the major issue Char-Broil have had in making their recent Combi’s. I’m happy to report that the heat output here is excellent so there’s an opportunity to cook some Burgers and Steaks very quickly. They’ve achieved this by upping the BTU’s on all 3 Burners to 13,333 giving you a total BTU output of 40,000. The Gas/Charcoal Hybrid only had 30,000BTU’s across its 3 Burners. So you get much more power. And while they’ve kept the outward design of the Burners the same as on previous models, their performance in heat dispersal is vastly improved. They’ve also kept the same Cast-Iron Grates that I liked from the Hybrid. So that’s problem solved for Char-Broil. Great Gas Grill. You can cook some really tasty food on this. 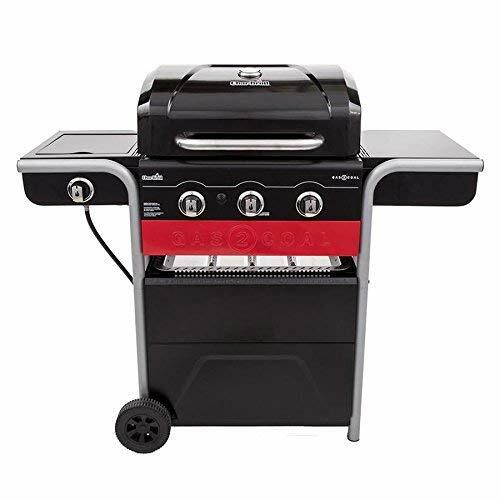 The idea is that if your cooking on Gas and you decide you want to Grill with Charcoal then there’s a four-step procedure Char-Broil claim takes 60 Seconds. You take off the Grates and pull out your Charcoal Tray from its little storage location just beneath the Cooking area. Then you fill it with Charcoal, place it onto the Grill and put the Grates back on over the top. The Burners will light up the Charcoal. It takes a little longer than 60 seconds but it’s really easy to do. On previous Char-Broil Combi’s you had to find a place yourself to store the Charcoal Tray which was annoying. So I was glad to see the little compartment they’ve installed for this one. There is still the problem of the Charcoal taking a while to light. But, with the improved Burners, they’ve got the time down to about 10 minutes. Not great but much better. And the food tastes amazing. Everything is Porcelain-Enamel coated so just use some warm water and a rag. Most of the debris should fall off at the first pass. It’s 12,000 Btu’s and sits to the left of the cooking surface. That’s pretty powerful considering you usually get about a 10,000BTU Side-Burner. You can do Sauces on this but you can also Sear Steaks. It certainly adds more space to that which you already have. I liked that it comes with a Lid too. That’ll up the durability. There’s no doubt that the strong points here are the Gas Grill and the Side-Burner. They’ve improved both the power and quality of the main Steel Burners for this model. So heat moves more quickly along the Cast Iron Grates and the time you have to wait for cooking temperatures to be reached is much reduced. Food tastes great and cook times are relatively short. The Side-Burner is same as the one they used on other models and rightly so because it was a strong point of Char-Broils. The Charcoal Grill while easy to switch to, does take quite a while to light. The Burners need at least 10 minutes before you see the fire. Food tastes great on it but that’ll put off some buyers and it’s a problem Char-Broil need to solve. The build quality is pretty good. Not as good as on other Combi’s in the 400-500 Dollar price-range but this costs less than them so It would be unfair to judge it by these standards. Especially as the durability is still there. Overall I’d say this is an excellent deal as Char-Broil has made vast improvements from previous Combi models I was critical of. Thank you for reading.